A Blissful Ceremony was held at Letchworth Dhamma Nikethanaya on Sunday 05th June 2016 to remember Venerable Bhante Samitha’s Beloved Mother Mrs D D Mendis on Third Month. Dana was offered to over 17 monks representing all the temple in UK. Bhante Samitha is a very grateful all the monks who attended the Dana Ceremony with such affection. Bhante Samitha is very grateful to all the devotees and friends who support in numerous way to make the ceremony a great success. A Special Dana ceremony was held to mark the Third Month Commemoration of Mrs Dedimuni Dasawathie Mendis, the Beloved Mother of Bhante Venerable Akurala Samitha, at Letchworth Dhamma Nikethanaya Buddhist Centre on Sunday 05th June 2016. Seventeen Distinguished Monks representing all Buddhist Centres in the United Kingdom participated to grace the Dana Ceremony. Among them Chief Prelate of Great Britain and Head of London Buddhist Vihara Most Venerable Bogoda Seelawimala Pradana Sangha Nayaka Thero, Most Venerable Tawalama Bandula Thero (Deputy Head of London Buddhist Vihara), Most Venerable Dr Witharandeniye Kassapa Maha Thero OBE (Head of Birmingham Buddhist Maha Vihara), Most Venerable Dediyawela Wimala Maha Thero (Head of Letchworth Buddhist Vihara), Most Venerable Makure Mangala Maha Thero (Head of East London Buddhist Cultural Centre), Most Venerable Dr Kaballewe Sirisumana Maha Thero (East London Lumbini Vihara), Most Venerable Matugama Gnanaloka Maha Thero (Head of Satara Devalaya Ancient Temple, Galle), Most Venerable Gunnapana Sumanarama Maha Thero (Head of Edmonton Samadhi Meditation Centre), Most Venerable Teldeniye Amitha Maha Thero (Head of Nottingham Shanthi Buddhist Centre), Most Venerable Mapalagama Soratha Maha Thero (Deputy Head of Birmingham Jathawana Buddhist Maha Vihara ), Most Venerable Gonulle Assaji Maha Thero (Croydon Surrey), Most Venerable Beragama Piyarathana Maha Thero (Birmingham Jethawana Maha Vihara), Most Venerable Dodangoda Sumedha Maha Thero (Leicester Buddhist Vihara), Most Venerable Thissapura Sugatharathana Maha Thero (Head of Liverpool Buddhist Vihara), Most Venerable Bangladesh Pannasiri Thero (East London Lumbini Vihara). All the members of the Dhamma Nikethanaya Buddhist Centre, Friends and Devotees of Bhante Samitha affectionately joined the ceremony. Everyone worked very hard with deep love and affection to the beloved mother. Everyone’s tireless and genuine support makes the ceremony a successful and powerful one. Venerable Bhante Akurala Samitha take this opportunity to thank and pay deep respect to most venerable monks for attending the dana ceremony by taking their valuable time. 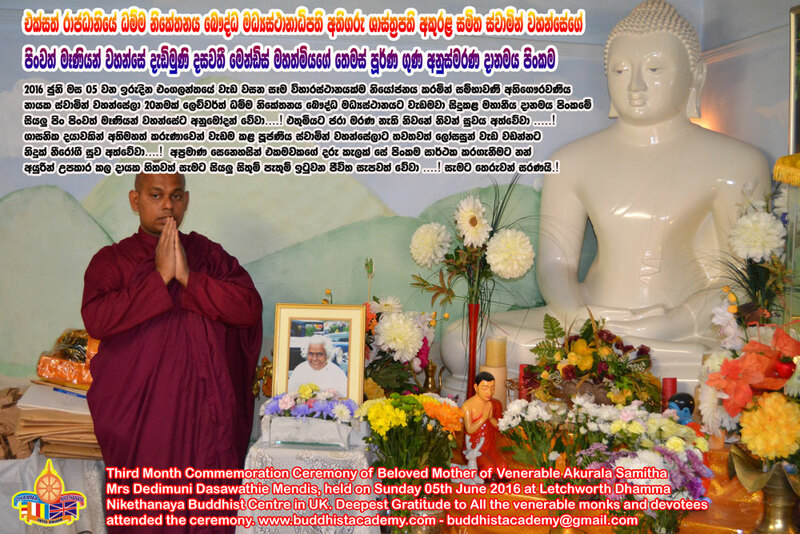 Venerable Bhante Akurala Samitha deeply touched with the affection showed by the devotees and friend at this very difficult time and wish to share the blessings with all. May the Beloved Mother Mrs Dedimuni Dasawathie Mendis attain Supreme Bliss of Nibbana!